We don't normally think about the sewer system in our homes until there is a problem with it. Most signs of trouble with your sewer system will become apparent in the house but homeowners should be attentive so problems can be spotted early. Sewer problems can happen in both older and newer homes. A sewer drain clog can rapidly become an emergency and potentially a hazard to the occupants of the home and also a tremendous expense. When the main drain that connects your system to the city sewer system becomes clogged it will eventually back up all the drains and toilets in the home. If this water flows back into your home, it takes professionals to clean it up because water that is mingled with sewage is considered a bio-hazard. 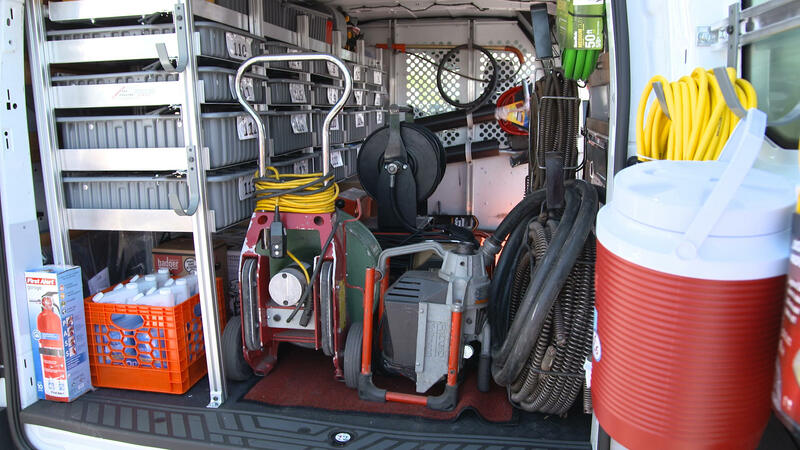 George Brazil Plumbing and Electrical has all of the equipment for any drain job! More than one plumbing fixture such as sink and a washing machine or dishwasher are backing up at the same time. Because toilets are connected almost directly to the main line going from the home sewer problems do tend to show up here first. However, you should never assume that a sewer clog is only associated with toilets because the issue can show up in any drain or plumbing fixture. If you have more than one drain clogged especially the water fixture that you don't use as frequently, there is cause for concern. if you notice that your toilet begins gurgling or making a percolating sound when other water fixtures are being used such as the dishwasher or the washing machine, pay close attention for other signs such as the bubbling described below. If you have plunged your toilet, there may be some bubbling as the air works itself out. However, if the bubbling persists after the toilet has been flushed a few more times, it's time to call George Brazil! If you see bubbles in the toilet after you flush or in the sink as it is draining pay attention to see if the problem occurs each time you use that water fixture. When there is a clog or blockage in your drain, water will try to pass through it. If the water cannot get through, bubbles will form that can be visible in the sink or in your toilet. If you see bubbles or gurgling this may indicate a drain problem, especially if this occurs when water is being drained from another fixture such as the sink or your washing machine. If you discover a foul smell of sewage coming from drains either in the basement or even a drain, you should definitely investigate. Most drains have a P-trap, but if the drain isn't used very much the water can dry out. If you think this may have happened, just run water in the drain to see if the smell goes away. If it doesn't, it may be time to call your plumber. If you have a drain or toilet that is draining slowly and it’s clear that the clog is not isolated to just one of these fixtures you should be concerned. Normal plunging of your toilet drains or chemicals designed to break up clogs will not be able to tackle the big problem in your main sewer line. Keep in mind that water fixtures that are closest to the main sewer drain will likely be affected first such as the basement bathroom or a laundry room located on the first level of your home. If the toilet or drain in the basement is draining properly with no issues, then the clog may be elsewhere in the home. Most newer homes will have a clean out, a piece of white pipe with a cap that projects out of the ground somewhere in your yard. If possible, remove the cap to check for standing water inside. This is also another warning sign that your main line is clogged. If the warning signs are there, you need to call a plumber. 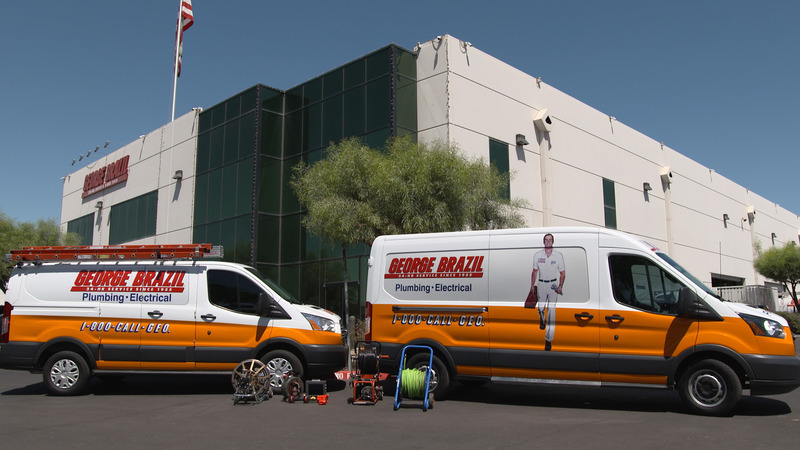 As you know, George Brazil Plumbing and Electrical can take care of any drain problem. There are some precautions that you can take in the meantime while you wait for us to arrive. If you used chemicals to try and clear the clog by yourself, write all of them down. By the way, we do not recommend using chemicals. If possible, turn off the water to your home using your main shut off valve. If this is not possible, avoid adding any other water to the drains whether that's washing your hands or flushing the toilet. If you have multiple family members in the home, it might help to post a sign or piece of tape to remind them not to use that fixture until the plumber arrives. Check with neighbors to see if they have experienced any plumbing issues or similar problems in their home. If so, this may be indicative that it's a much bigger problem than just your sewer line and plumbing. If you live in an older home, it is a good idea to have a plumber check your pipes yearly for any tree roots or other damage to your pipes. It's a good idea to be mindful of what you flush down your toilet or put down the drain. Infrastructure and treatment plants are often strained by the amount of trash and inappropriate items that people flush down the toilet with no regard to where it all goes. By disposing of your trash properly you will not only be taking into consideration the impact you have on the environment, you will be doing yourself a favor in the long run. Lastly, feel free to call George Brazil Plumbing and Electrical at any time! We're here to help! George Brazil Plumbing & Electrical provides old fashioned, high quality, professional customer service done right the first time to create comfortable, healthy, safe and energy efficient places to live and work. 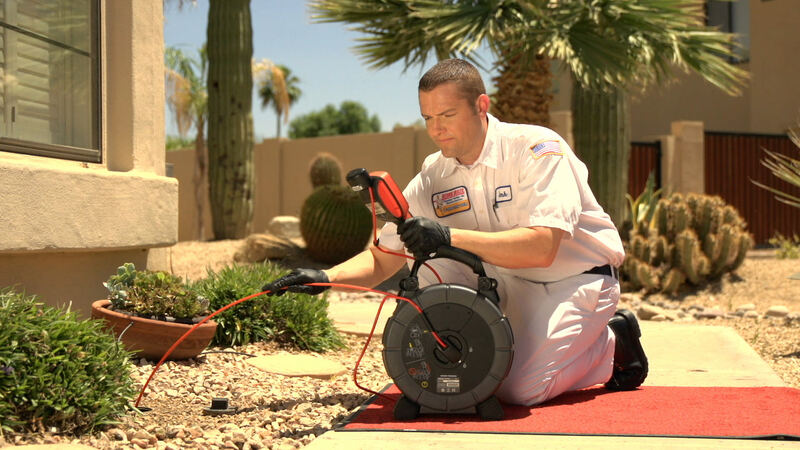 We provide the best plumbing and electrical repairs for the entire Valley of the Sun, including Scottsdale, Mesa, Gilbert, Chandler and the Phoenix metropolitan area!